Nick’s birthday that was devoured quickly on the beach of Dolly Varden Point. 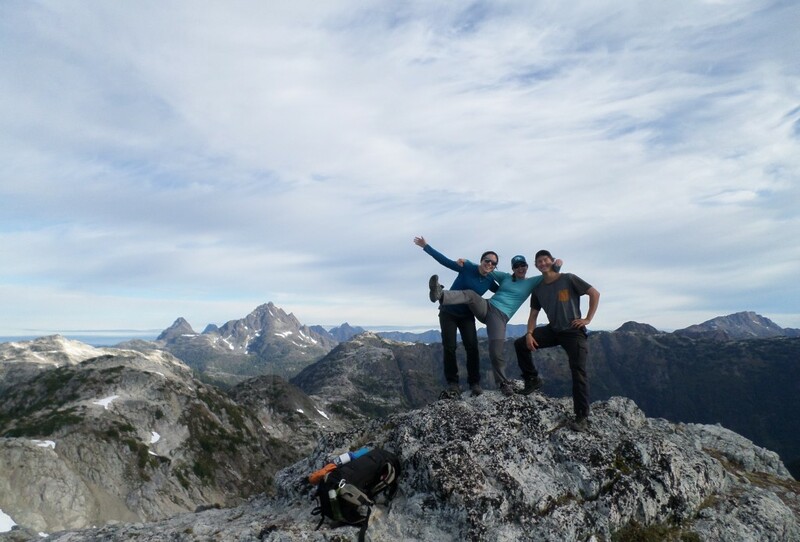 In the spirit of the peak bagging challenge that has been taking place this summer, our group signed on to attempt to summit the Golden Hinde, the tallest peak on Vancouver Island. It is a trip that has been done in less than 24 hours, but most parties take three to seven days, out and back. The four of us gals were based on the mainland, so we took the 5:30pm ferry from Horseshoe Bay, to Departure Bay in Nanaimo. We were met at the other end by our drivers, George and Nick. As it was Nick’s birthday, Anna suggested that someone from George’s car pick up a cake for Nick on the way so we could keep it a surprise. Nick was following George’s car, so we all stopped at the store to pick up “Advil” for Anna, who happened to be the only passenger not in Nick’s car. She somehow managed to grab a cake without anyone noticing, and we were on our way. 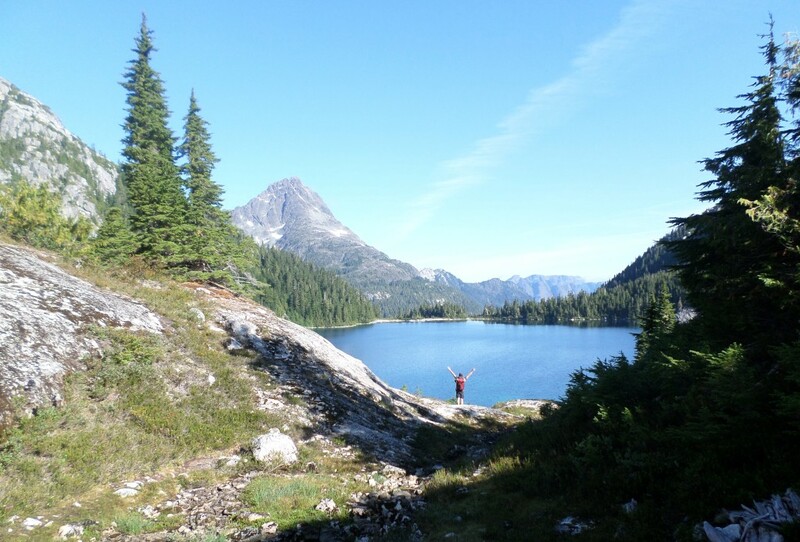 We drove for a couple of hours to reach Dolly Varden point on the North East side of Upper Campbell Lake, where we were met by one of Nick’s work friends, Felix. After putting together some air mattresses on the beach to sit on, we poured some beers. As soon as we were all together on the beach, Anna brought over the most incredible chocolate mousse cake! We sang happy birthday, and then promptly helped devour the cake. After some good conversation and star gazing, we went off to sleep. 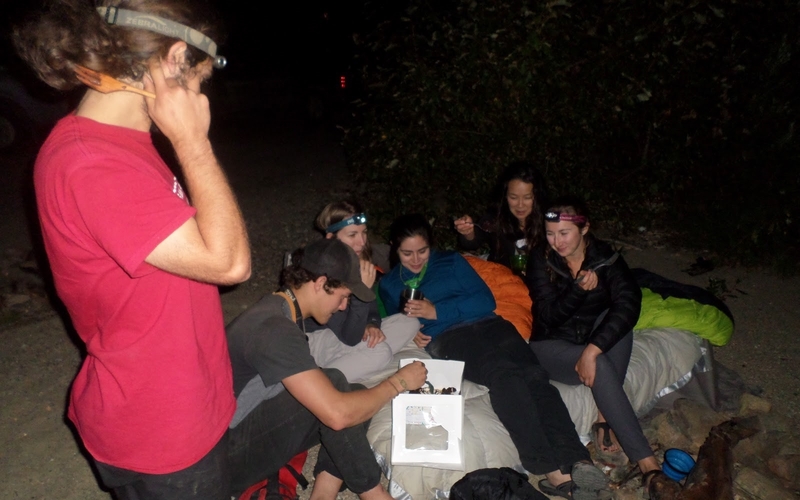 After our brief celebration of Nick’s birthday, everyone woke up early and got ready to head towards the Strathcona-Westmin Provincial Park. Once at the trailhead, located next to the Myra Falls Mine, we divided tents and equipment for the 4-day trip. A watermelon was included as part of the essentials and Felix decided he would carry it to the top, eat it, then wear it as helmet for the descent. The first section of the trip included a daunting number of switchbacks at low grade; these allowed us to chat a bit, hear awesome stories about caving and learn new words like ‘tramping’ (word used for hiking in New Zealand). After the switchbacks were over we arrived at Arnica Lake which was received with pleasure by all of us with our VOC swim birth suits. Once refreshed and less smelly we continued our journey onto Philips Ridge. A few kilometers up the ridge we found a survey marker and completed our first peak of the trip, P1. From there we could finally see the Golden Hinde! After a couple of pictures, we continued on towards the next peak, P2. Sarah was starting to get very excited about all the peak bagging involved in this trip; George and Nick jokingly name the peaks Allen and Robertson on the GPS since the original names were not very creative. 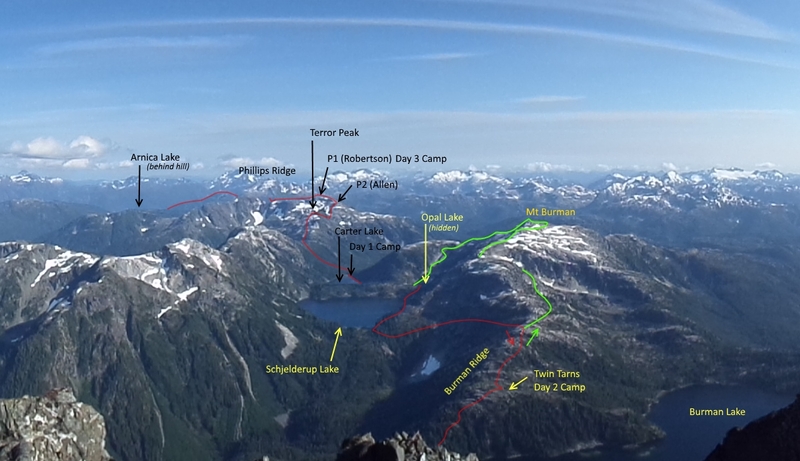 The last peak to summit on the ridge was Terror peak. 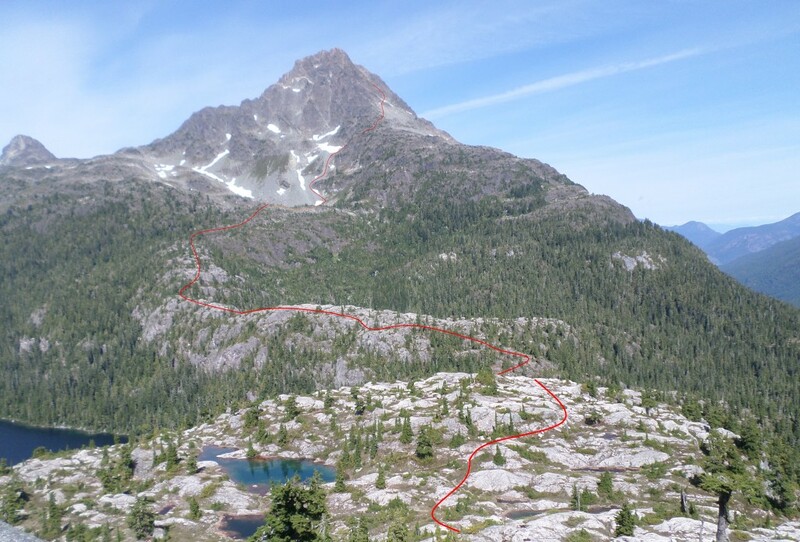 The peak was named on Robin Tivy’s trip when their group lost the trail and ended up having to down climb a class 3 6 meter ledge which Betsy Waddington described as absolutely terrifying. We were more fortunate and managed to avoid the Terror. We still however got to get our photos on the peak. 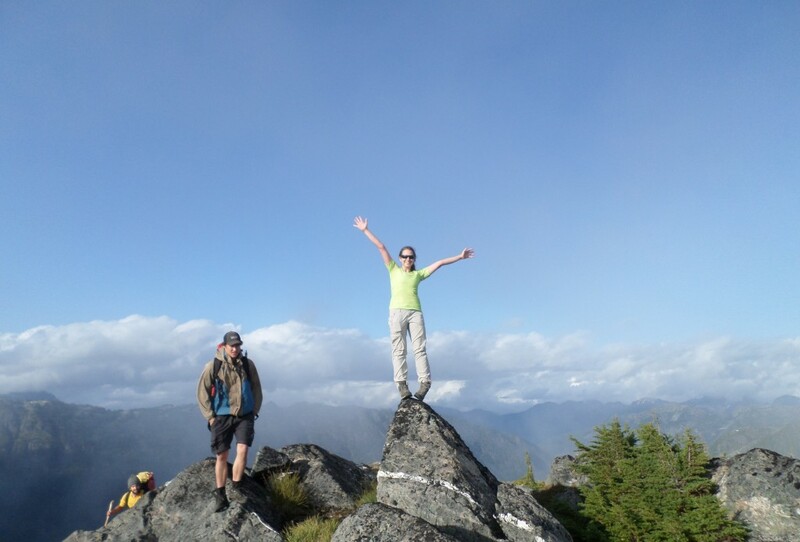 Sarah Taylor celebrating Terror Peak, the third already of the trip on the first day of hiking. The day was long so we continued following the cairns along the ridge until it was time to descend towards our campsite. The descent was a bit tricky since it was steep and a combination of tiredness and slips made most of us get their bums full of dirt. After our 20km hike, we arrived at Carter Lake (approx 1,250 m elevation) just as the sun set. Everyone was tired but very happy after we accomplished our goal of the day. A brave few of us bagged our second lake as part of the VOC skinny dipping challenge. Anna found the perfect spot to set her tent where Mirtha and she slept. Dinner and plans were made for the following day. The valley surrounding us was very steep and so at our 7am wake, the valley was still shroud in the shadow of Burman. Even so, it was brighter than when we arrived and we were truly able to appreciate the spectacular colour of the lake. Today’s weather was forecast to be cloudy with chance of showers, but this couldn’t have been more wrong as there wasn’t a cloud in sight. 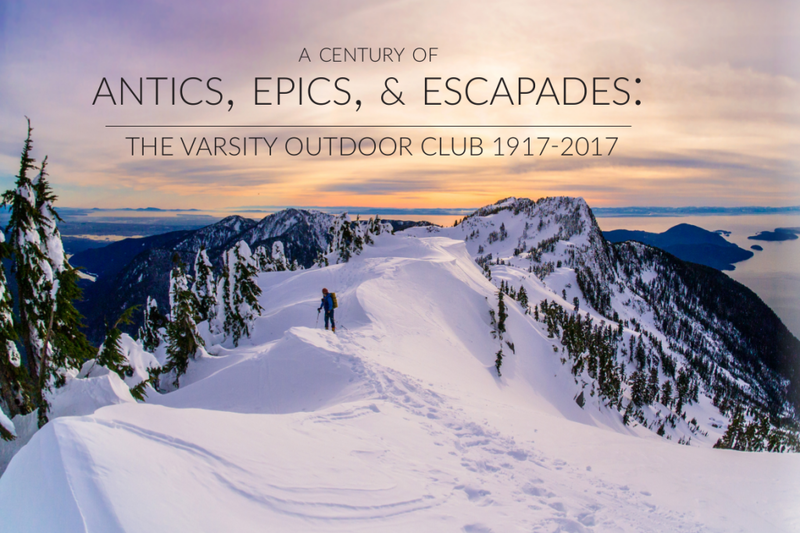 For our summiting day, we couldn’t have asked for anything better. With everyone packed up, we headed up beside Carter Lake and filled our water at a small waterfall from the creek that fed the Lake. We continued up past Opal Lake and over the small hill that separated Opal Lake from Schjelderup Lake. Descending down the small hill of a col, we encountered one of the most gorgeous sights of the trip. Schjelderup Lake sparked a breathtakingly brilliant blue with the Golden Hinde’s 1000m prominence fully visible immediately behind the lake. It was here that we bagged our third lake of the trip! Nick in front of Schjelderup Lake with Golden Hinde in the Background. 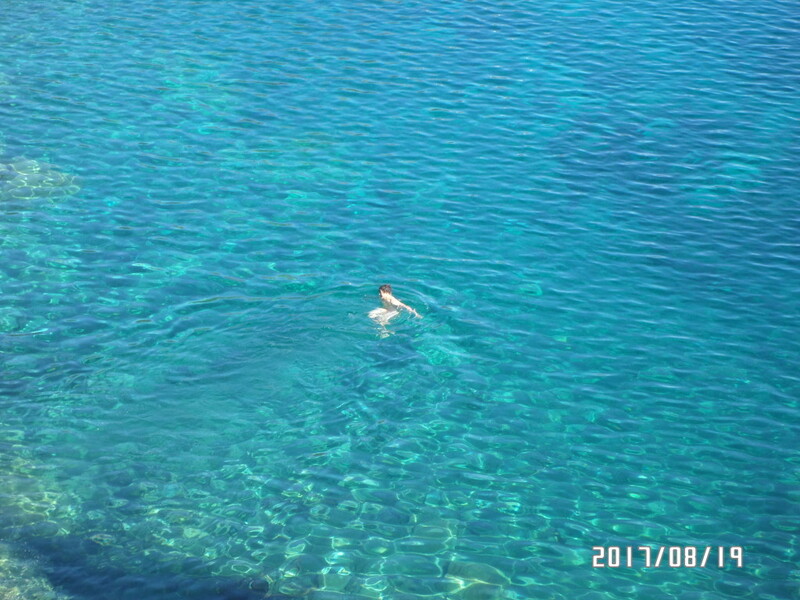 Nick enjoying the brilliant blue waters of Schjelderup Lake. Esther and Nick looking out at the Behinde and the Golden Hinde. By the time we reached the other side of the lake, Felix admitted that watermelon felt more like a bowling ball and just looked to darn appetizing to continue without devouring it. And devoured like candy it was. After our candy break we headed up to the Burman ridge in search of the twin tarn’s camp that received such raving reviews from Robin Tivy in his trip report in 2003. It was about 1:30pm when we reached the camp. Not surprisingly, here we immediately bagged our 4th lake. Mirtha’s knee was bothering her a bit and so she decided stay back at camp rather than continue on. With sunset around 8pm we were starting to become concerned that we would not reach the peak before our 5pm turn around time and so we made the decision to split into two groups. Nick, Esther, Felix and I went ahead in one group and Sarah and Anna followed behind. After leaving twin tarns, the ridge descended about 100 or so meters vertically into a gully that seperated the Schjelderup Lake drainage from the Burman Lake drainage. In the gulley we were only about 50m away from Burman Lake, however after dipping into one of the tarns and doing a descent to the lake rather than an ascent many of us were still recovering from our last dip. We made a decision that we would bag it on the way back. We would later regret that decision. Morraine Lake was our 5th bagged lake. There was a protrusion into the lake that allowed us to do it in the form of a cannonball. This was by far the coldest lake; it shone deep blue and had an entire slope of snow falling into it. We quickly warmed up afterwards though as we climbed the south facing skree slope. We stopped before a narrow class 4 chute and for some reason, the first group decided to go up it rather than continue around it on the skree. Back at the lake, Sarah and Anna had arrived but Anna not feeling well decided to turn back to camp. Sarah decided to continue forward but seeing us go up the chute decided smartly that she would just go around on the skree. Our route from twin tarns (in the foreground) to the top of the Golden Hinde. We followed the south skree slope up a couloir that deposited us on the south east skree slope. We went upwards traversing towards the northern highest edge of the slope. It was here we reached a very steep couloir. The couloir was about 150m long, rose up at about 55 degrees and was filled with a glacier such that the climbable path was only about a meter wide. It was at this point that Nick, Felix and I regretted leaving our helmets behind at the car. It was a lesson I learnt not to be cajoled and seduced by the thought of a lightpack in exchange for the safety equipment that I had notions was necessary before hand. With Nick and Felix ahead of Esther and I, there were a few small rocks coming down from above but with slow and extra care in our ascension we managed to scramble up without issue. About two-thirds of the way up, the glacier came so close to the side of the couloir that we could no longer continue up and we had get up onto the glacier and cross to the other side of the couloir. This was by far the most nerve racking part of the trip. The glacier was only about 3m wide, but with the slipperiness of the snow, the steepness of the slope and the length of the slide any slip could have had extremely severe consequences. If ever there was a no-fall zone for summer time, this was it. To combat this particular challenge, we dug footsteps into the snow to secure our footstep which allowed us to cross more comfortably. After crossing the small glacier, it was a short 50m scramble to the summit where we became privilege to unlimited views in all direction. We were amazed to discover not only did we reach the summit, but we had reached it half and hour earlier than we planned. Numerous summit snacks, sightseeing and photos later, up onto the summit arrived Sarah! She had utilized her superior scrambling route finding skills from before to avoid the couloir. From the peak we could look back and see just how far we had come. We waved to Mirtha! Felix was addicted to that summit feeling and didn’t want to come down so while Nick explored for a better route down than the couloir, he hung around at the top with Sarah while Esther and I followed Nick. To our surprise we discovered an open sunshine filled bowl just beside and to the Sorth of the couloir that allowed us to easily descend to South-East skree slope and eventually to Morraine Lake. Sarah and Felix followed shortly thereafter but while on the way Sarah realized her knee was hurting and so Sarah took her time on the way down while we hung out near the Lake playing an aggressive game of tag with the mosquitos. In “hinde” sight, we probably should have waited closer to the lake where the mosquitoes were less prevalent. With all of us at the Lake we headed out on the last little stretch back down to the Schjelderup-Burman gulley and twin tarns. We went at a slower pace so that we could all stay together with Sarah. By the time we reached the gulley dusk was arriving and the temperature had gone down quite noticeably and none of us really felt like getting Burman. Even so, after a small 20m bushwack Nick and I reached the lake and we realized that this dip would be most difficult of all as our access was limited to a portion of the lake that was so shallow we would have to lie down flat to submerge ourselves. I bailed, but nick braved the challenge. By the time we started to head back up the gulley our headlamps were on and evening had certainly arrived. About half way up we found Sarah who was off to the side of the trail. Her knee was hurting even more. She exclaimed, deeply sorrowful “I lost the trail, I am not going to make it, I’ll just stay here”. “You are just a step off the trail Sarah. We are almost there! Just up the hill is your warm tent and sleeping bag. You can make it”, I encouraged. I helped her up and together we trudged the last 20min back to our camp where we promptly made dinner and watched the starlit night before retiring. We awoke to a heavy sweeping fog and we said say our goodbyes to Felix who was already packed up and ready to leave. He had to head back to his work as a cave guide Monday meaning that what the rest of us were going to do in two days, Felix was going to accomplish in one. That morning in the second of the twin tarns I bagged the 7th lake of our trip. 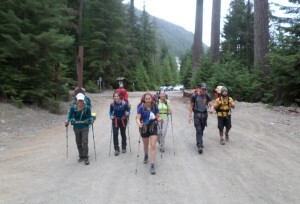 Once all of us were packed up, we started off back up Burman ridge. The plan today was to summit Mt. Burman, before heading back to Phillips Ridge. Tonight was the new moon and we hoped to camp somewhere on the ridge to get a good view of the stars. Mirtha’s knee was still not so good and so Esther and Mirtha decided to go back to the ridge the way that we arrived rather than over Burman. Sarah surprisingly was all skipper and refreshed from the day before and was ready to summit Burman. She was determined to get the points for the peak bagging challenge. Burman Ridge was a fun jaunt through small treeline bluffs and along a fairly low angle slope up to the peak. Nick practically ran up there and had a 20min nap in the sun while Anna, Sarah and I worked our way up. At the peak we found the geo-cache and noticed that not only had Felix started back to the car, but he summited Mt. Burman first and left us a note in the log. We came off the peak along the south-east ridge and dropped down the large open bowl above Opal Lake. Here, we bagged out 8th Lake of the peak. Opal Lake was a fun spot as it had a few high spots which to jump off from. It made me wish I had packed a wetsuit to stay in some of these lakes longer than 15 seconds. Thereafter ensued the discussion of the parabola/decaying sinusoidal wave of backcountry packing. 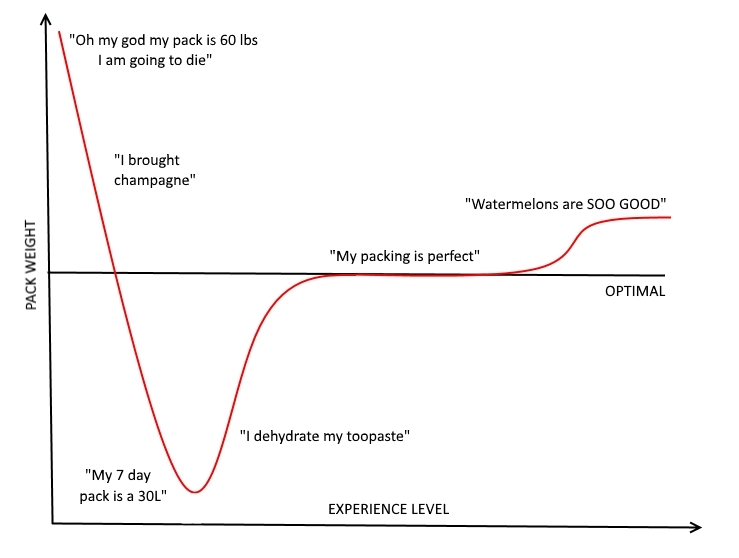 The pack weight to experience level chart. We passed Carter Lake and climbed up the steep treed slope to the ridge where we met up with Esther and Mirtha. By the time we had summitted Terror Peak the fog had moved back in and the long day was starting to get to us all. We pushed on though . We wanted to get farther so our last day hike would be an easy hike out. While retracing our steps we found the trail started to circumnavigate P2 rather than going up and over as we had on our way up. The slope up P2 was steep so this new trail was gladly accepted by our party. Sarah was on her last reserves on energy and the easier trail was very welcoming. Around 8:15pm we reached the P1 summit just as the sunset began on the horizon. The view was spectacular enough for us to decide that this would be our camp for the night. As the sun set over the horizon the last remnants of the fog cleared out giving view to the most gorgeous sunset. We soon realized that not only were we going to get a phenomenal sunset, but that with the new moon fully in phase we would get a spectacular 360 degree starlit sky. We played a round of cards before deciding to just lie outside on our matts in our sleeping bags on the peak watching the stars fall from the sky and experience what was the best night of the summer. Panorama of the sunset from P1, with the Golden Hinde distinctly in the distance. We awoke to clear skies and ate breakfast feeling like we were on top of the world. We set out from the peak and towards Arnica Lake. Halfway down at 10:22am the solar eclipse reached its greatest coverage at 85% and the whole landscape went dim. Shadows seemed to disappear and it suddenly like an severely overcast day, but darker. We knew we weren’t supposed to look at it. I think the others were better at restraining themselves than myself as I took a peak at the reflection in one of the nearby lakes and off the screen of my phone. All in all however, the whole event was somewhat uneventful since we couldn’t look at it. If only we brought the proper glassware. At Arnica Lake we went for our last dip in the lake and sun-tanned in the sun for a bit for before heading out down the 77 switchbacks to our car (yes we counted). Nick and I played FizzBuzzWhiz. I was about as bad as a fish swimming in a desert. At the car we celebrated our long accomplishment with chocolate wafers and we set out to catch the last ferry back to the mainland with full bellies from the Powell River A&W and cheek to cheek smiles. From left to right: The Behinde, The Golden Hinde, Mirtha, Anna, and Nick. I think these watermelôn related photos help add some context. Note Felix’s truly unique packing in the first photo. Thanks for writing this up George and co.! Such a fun area… I want to go back! Felix, Owen and I miss you from Sydney. And hate you for having so much fun! !